The first classical organ method for children, the Suzuki Organ School is based on Dr. Shinichi Suzuki's Mother Tongue Method. The Suzuki Method of Talent Education is based on Suzuki's view that every child is born with ability, and that people are the product of their environment. According to Suzuki, a world-renowned violinist and teacher, the greatest joy an adult can know comes from developing a child's potential so he/she can express all that is harmonious and best in human beings. 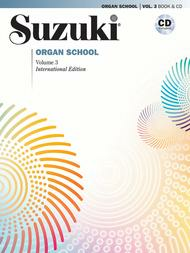 Each series of books for a particular instrument in the Suzuki Method is considered a Suzuki music school, such as the Suzuki Organ School. The student listens to the recordings and work with their Suzuki organ teacher to develop their potential as a musician and as a person. This Suzuki Book & CD is essential for Suzuki organ lessons. In certain pieces, the authors have placed small phonetic signs above the notes to indicate differentiated non legato playing. In order to develop pedal technique, pedal melodies are included between every manual piece. The included performance CD for Volume 3 is a great tool for Suzuki organ lessons, encouraging practice while featuring recordings by Lars Hagstrom. Titles: Ode to Joy (Beethovan) * Our Tram (French Tune) * May Song (German Folk Song) * Swedish Lullaby (Traditional) * Swedish Folk Tune (Traditional) * Etude (Suzuki) * Wish Song (Folk Song) * Chorus from Judas Maccabaeus (Handel) * Christmas Song (Traditional) * Andantino (S. Suzuki) * Shipwreck (Danish Folk Song) * May Time (Mozart) * O Come, Little Children (Folk Song) * Gavotte (Corelli) * Preparatory Exercise (Lemmens) * The Happy Farmer (Schumann).